I’ve been known to say that my life has changed forever since my partner Andy and I got a van. Before the van, it hadn’t really crossed my mind – but quite quickly I realised that I now can’t imagine my world without one. 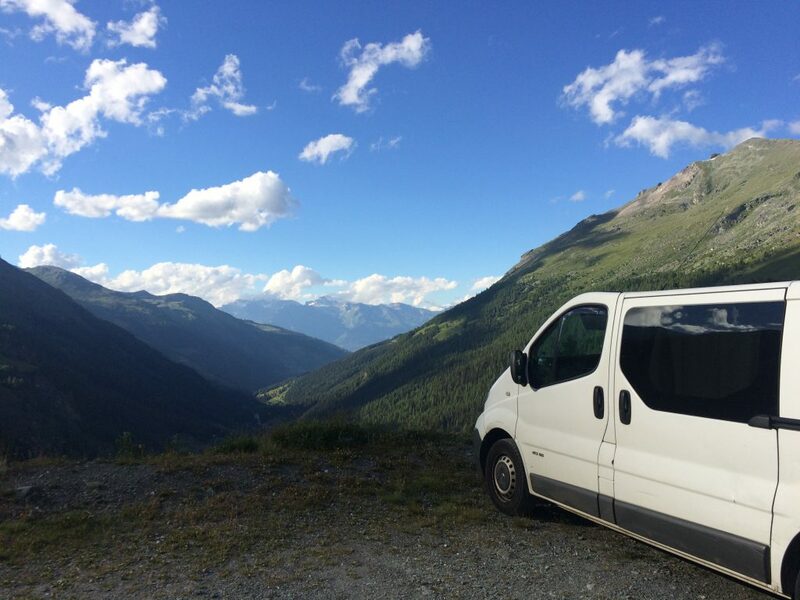 We recently worked out that we have spent over a third of our time living in the van since we first got it! To put that another way, that is every single weekend of the year, and then some! But whilst we spend a lot of our time on the road, we barely ever spend any of those nights at a campsite. On the road, the van is our home. It’s where we sleep, it’s where we cook and eat*, it’s how we get about, and it’s a packhorse for all of our gear, too. Part of the point of living in the van for us (aside from the freedom), is keeping low costs and the ability to live off the grid. In this sense, one of the main things that we get asked about when we talk about the van, is how we find places to sleep. *For those who are wondering how and what we tend to cook on the road, we swear by our Jetboil Zip and posh versions of ‘Pot Noodles’. Basically, if you hike and camp, you practically have all the gear you need to go on the road, whether that’s in a van or not! For example, during our 9 day North Coast 500 trip, we didn’t stay in a single campsite. And during our 3 week trip through Spain and Portugal, just one night was spent at a campsite. 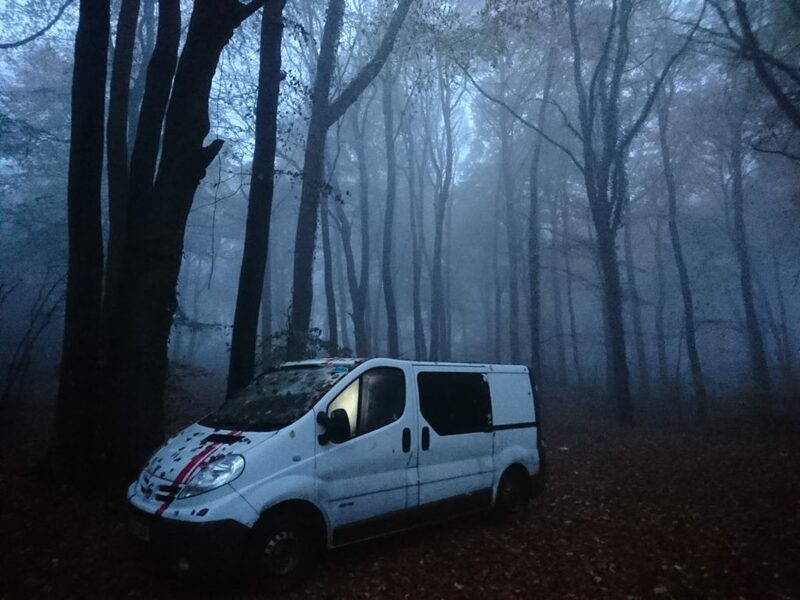 Most people we speak to are often comfortable with camping at campsites in their vans, but are nervous of ‘stealth camping’ – parking up (for free) for the night in a carpark, lay-by or other designated area on public land. But actually it’s incredibly easy, and we have yet to experience any real problems or trouble in doing it. If you are sensible about it and keep your wits about you, there shouldn’t be a problem (for example, majority of thefts take place in the busy, popular areas). As well as a lot of advice on how to prepare for a roadtrip in a van (for example check the local laws with regards to driving and make sure you are carrying the correct equipment in your vehicle, avoid peak season and ensure you have insurance and breakdown cover where you are going), there’s also a lot of readily available advice in the forms of internet reviews and recommendations for places to overnight in a van – many of which needn’t be campsites or even lay-bys. 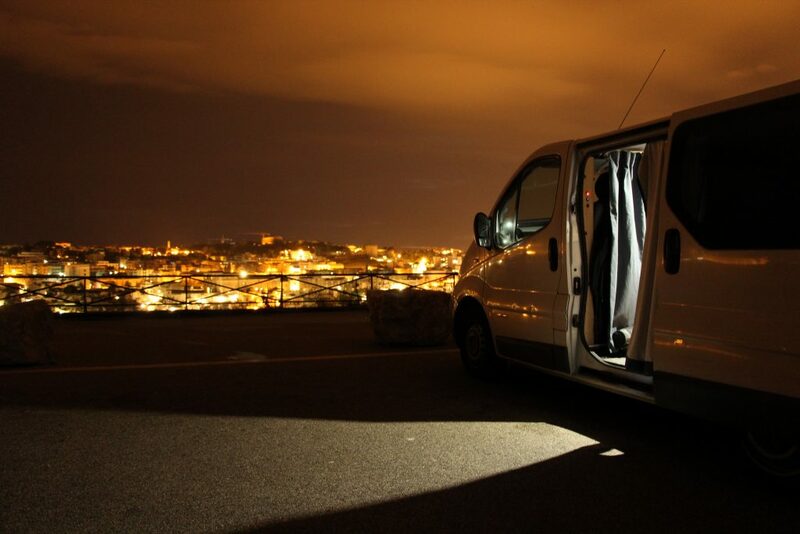 We swear by the app ‘Park4Night’ (available on Android and iPhone, https://park4night.com/), which is a free, user-generated map of all the places people have stealth camped in their vans, all over the world – incredibly useful if you want to get an idea of a tried-and-tested area to bed down for the night. Further to this, we make sure we know the rules of the road – and in particular around stealth camping – for whichever country we are visiting. 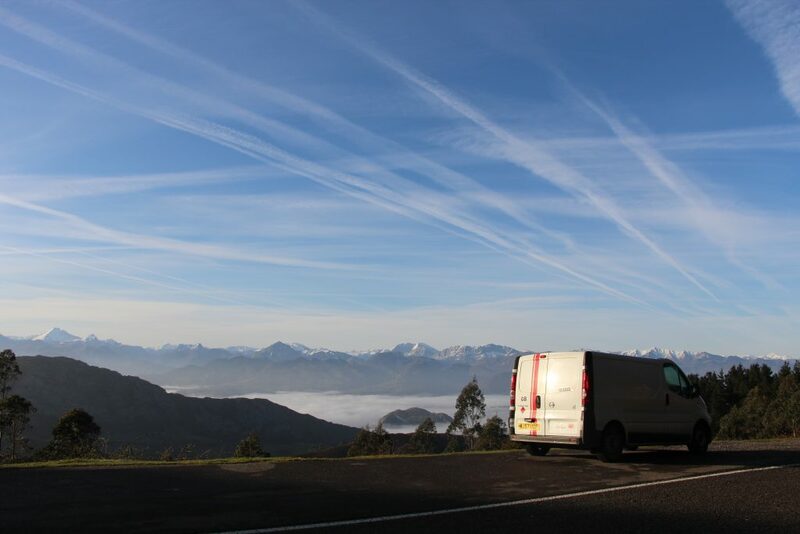 There are lots of places in Europe which really love the campervan community – such as Portugal and The Netherlands. In a lot of these areas, you can find small ‘communities’ of campervans. I like to think of it as a little pack or herd of vans, as there is a bit of a consensus of safety in numbers with vanlifers. Basically, if there are a few of you in a small area, and you’re acting responsibly, you’re not going to be pestered or moved on. And because you’re all there for the same reasons (to travel and enjoy the world using the same ways and means), people are usually decent and friendly to each other – there’s an understanding between you, just like can be found in other outdoor communities (like rock climbing or trail running). However, there are some countries where it has become a bit of a problem with people leaving litter and being generally irresponsible in the way they are camping (e.g. parking in nuisance areas and not putting money back into the local economy). For this reason, countries like Croatia can be particularly wary of stealth campers, to the point where there police will feel for the heat of the vehicle engine to determine whether or not it has been left overnight. It’s also worth pointing out that some countries have laws around tourists having to register with the local police every few days. In a hotel or at a campsite, your host should do this for you, but staying in a van and stealth camping, you must do this yourself. Having said that though, travelling by road in Europe with a European passport is (currently) extremely easy, due to the open borders of the EU. As a British vehicle whose occupants have British passports, out of 20 international border crossings we have made, we have only been stopped and searched a grand total of 3 times. And even then we didn’t feel threatened in the least. Now, if you’re thinking about showering and washing, there are also ways and means. A lot of service stations in mainland Europe have shower facilities available at them. There is of course the possibility for wild swims, wet wipe washes, and even solar-showers. Or, as we tend to do, you can just rough it! Wearing deodorant and regularly changing into clean clothes means that actually there are little to no unpleasant smells. But more often than not, your body thanks you for not washing as regularly anyway, since all the natural oils that your skin produces are allowed to remain and work as they are intended to, instead of being stripped away by hair and body soaps and gels. So, now that that’s out of the way, here are a few of our favourite stealth camping spots.